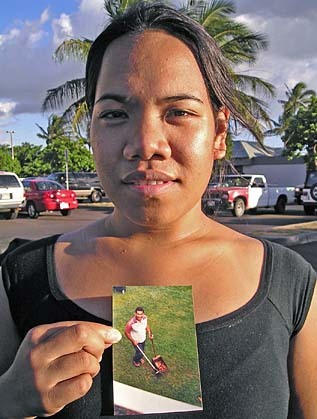 Promis Salunga held a photo of her stepfather, Sefita Tupou, who died Monday. Tupou was widely known in the Tongan community on Maui. LAHAINA >> Sefita Tupou left his native Tonga more than 20 years ago to find a better life, but never forgot his family back home. "He sent money home to support his parents and sisters and brothers," said his stepdaughter Promis "Sana" Salunga. "He was a good man." Tupou, 46, who with his wife Taufa raised six children on the Valley Isle, died in a traffic accident in west Maui while driving his two teenage daughters from his home in Napili to seminary classes at the Mormon Church in Lahaina. He was fatally struck by a utility pole that was sheared off by a pickup truck that veered off Honoapiilani Highway near Puukolii Road about 6:05 a.m. Monday, according to police. The driver of the pickup, 20-year-old Vitikami Finau, was in satisfactory condition at Maui Memorial Medical Center yesterday. He is also a member of the Mormon Church in Lahaina. Tupou's children range in age from a 6-year-old girl to a 20-year-old son. Salunga said Tupou worked hard to support his family and was a wonderful man. "I can't find a time when he was mad at me," Salunga said. Salunga said although she was his stepdaughter, "He would always say I was one of his." Tupou, who worked at two resort jobs as a houseman, also regarded a number of wayward children as his own. Sam Ako, a Mormon church adviser, said Tupou took several children with no place to go into his home. "He was a guardian for a lot of kids," Ako said. Tupou, who served as a ward leader in the Mormon church, also liked to do random acts of kindness, such as gathering food for the Foodbank and offering to trim friends' trees for free, Ako said. Salunga said she'll always be grateful that Tupou decided to emigrate to the United States because life was difficult in his village in Tonga. "Over there is a hard life," she said. "You live off food farming and fishing." She said even though he's physically left them, he remains a part of their life. "We know he is with us. He is in heaven." A wake is tentatively scheduled for Sept. 24 at the Church of Jesus Christ of Latter-day Saints in Kahului, followed by burial the next day.